My name is Chris Dongoski and I am the Father of 3 great kids and husband to the most incredible person I have ever met I call my wonderful wife. I fell from a tree November 8th of 2009 while playing with two of my children and 6 other neighborhood kids in my back woods. The fall resulted in complete paralysis from the waist down after crushing my T11/T12 vertebrae and severely damaging my spinal cord. After the accident we had overwhelming support from friends, family, and even from people I had never met. It was truly remarkable and Julie and I were literally swamped with donations from our kids schools, friends, and families. I remember being in the hospital on the third day when an occupational therapist came into my room and inquired about my home. She asked me if my home was a one-story home. It was then that I realized I would probably be moving from my current home since it was a three-story home with stairs everywhere. My bedroom and children’s bedrooms were all upstairs. We did not know what we were going to do. We considered a chair lift attached to the wall but I was completely opposed because of the looks of it and the extra work getting on and off of the lift. We also considered building a bedroom and bath on the main floor, but again it would take away from the looks of our home. The other alternative was an elevator. I saw this as very expensive since I could not work I wrote this idea off. My wife friends got together and brainstormed and started looking into grants. 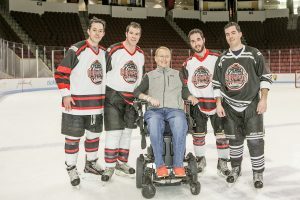 They came across the Travis Roy Foundation which looked like a perfect match for my situation. 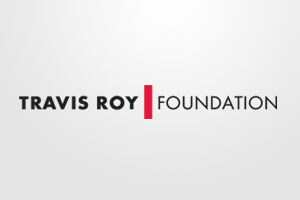 My wife applied and we received a grant from the Travis Roy Foundation. I now have a 3 story elevator which starts in the office of my basement, proceeds to a vestibule in the family room, and finally ends up in my master bedroom. I had to wait 3 months for the elevator installation after I got home from the hospital. I will never forget the unbelievable feeling it was to enter my kid’s rooms after not being able to for 6 months. I sometimes thank GOD while riding up on the elevator and thank Travis Roy on the way down. We will never be able to thank Travis and everyone at the foundation enough for the incredible gift which has enabled me to access my home as I did before my injury.